A top aide of President Muhammadu Buhari is in trouble over the role he allegedly played prior to the departure of the president to the United Kingdom for medical treatment, last week. There were indications, last night, that the aide, who has already courted many controversies for the Presidency, might be probed for the latest action and other scandals he had been enmeshed in since being put in the key post in the Presidency. According to Vanguard, it was told by a top government that the latest offence that got Buhari very upset, was the attempt by the said aide to breach the clear provisions of the Constitution regarding the transfer of power to the Vice President ahead of Buhari’s departure, last week. The source explained that although the President had upon his last visit to the U.K. personally told Nigerians that he would after his 49-day stay in London soon return there for a follow-up, the said official deliberately refused to share the information with other key aides of the president like the NSA, media aides and even the Office of the Vice President. It was learned that it was not until the day of departure of Buhari that he himself kept asking about the whereabouts of his Vice that his aides who were around, hurriedly put a call to Osinbajo to urgently meet with the President. 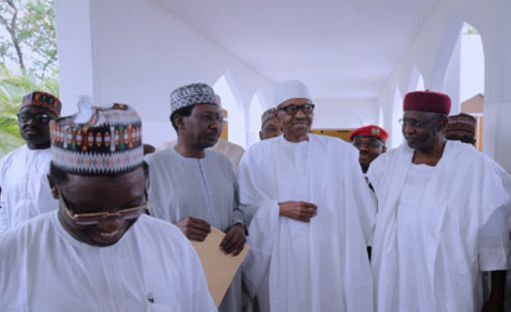 It was gathered that Buhari also personally put a call to the Senate President, Dr. Bukola Saraki, the Speaker of the House of Reps, Yakubu Dogara and the Chairman of the Governors’ Forum and Governor of Zamfara State, Abdulazia Yari, to meet him at the Villa before his departure. “The president actually insisted on calling the top government officials to come over to his residence that night to meet with him before his departure to ensure that there was clear understanding that he was travelling and wanted every relevant official of the administration to know about his trip and to demonstrate his full compliance with the laws of Nigeria. “Mr. President did not want to be dictated to by the said official, who had earlier suggested to him that the transfer of power to the Vice President should be limited, while he should be empowered by the President to act as a liaison between the Presidency and the National Assembly, during Buhari’s absence. “In fact, the man in question had actually drafted a letter meant for the president’s signature two days to Buhari’s departure stating that 'the powers of the Acting President be limited' while he (the aide in question) be authorized to coordinate things in a “broad sense until Buhari returns. “In the letter drafted by the controversial official for Buhari to sign, the officer also suggested that Osinbajo be restrained from taking any action on the Economy, Foreign Currency operations and the Central Bank of Nigeria among other strategic agencies of the government pending the return of Buhari. “Mr. President however shocked the aide largely believed to have won his heart by promptly rejecting the suggestions by taking the unprecedented bold step to personally meet with his Vice and the NASS leaders and brief them on the transfer of power to his Vice before leaving Nigeria for the U.K.
“It was at the meeting that Buhari pointedly asked Osinbajo to take full control of the administration and to have a free hand to run the system until his return to Nigeria, something that rattled the powerful aide, who is said to be rooting for the creation of a cabal in the Presidency for his pecuniary interest,” the source said. Top Government sources hinted that the President himself might have started losing confidence in the said aide when he constituted the panel which probed the suspended Secretary to give Government of the Federation, SGF, and the Director General of the National Intelligence Agency, NIA, without involving the beleaguered aide. “On that particular occasion, unlike before, Buhari personally drafted the statement in conjunction with his media aides announcing the suspension of the two men and the composition of a panel to probe them without the knowledge of the aide in question.